I've found some Jamestown discounts to make your visit to either Historic Jamestowne or the Settlement even better. Want to go as cheap as possible? Visit Historic Jamestowne and you can get in Yorktown Battlefield for free. Buy a ticket for Historic Jamestowne ($14 for adults, kids 15 and under free) and you'll get in Yorktown Battlefield at no extra charge! That makes a visit to both sites almost $6 cheaper than a combo ticket to Jamestown Settlement and Yorktow Victory Center. Plus, since kids age 15 and under are free, a family of four will pay just $28 to visit Historic Jamestowne/Yorktown Battlefield. Visit the other two and you'll pay $61.50! 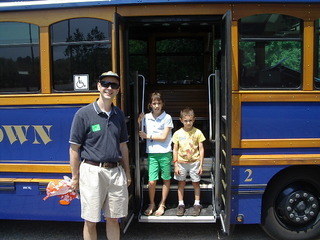 Take a trip on the Yorktown trolley-- it's free! If you want to visit four area historic attractions (Yorktown Battlefield and Victory Center, Historic Jamestowne, and Jamestown Settlement) this package gets you into all four for seven consecutive days for $35 for adults and $23 for youth ages 13-15, and $12.50 kids ages 6-12 (it's free for kids 5 and under). This package deal will save you $5-$6 over purchasing all of them separately. 3. Consider an America's Historic Triangle Package...carefully! 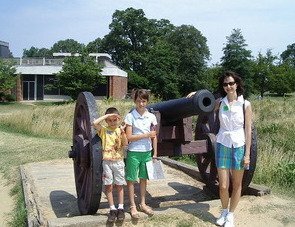 If you want to visit all five area historic attractions (Yorktown Battlefield and Victory Center, Historic Jamestowne, the Settlement, and Colonial Williamsburg) this package gets you into all five for seven consecutive days for $89 for adults and $41 for kids ages 6-15 (5 and under are free). Depending on what time of year you visit that may NOT mean any savings at all. In fact, here's what they said at the ticket office when I called to ask them about it: "The America's Historic Triangle ticket isn't so much for a cost savings-- it's more for flexibility, so you can go wherever you like whenever you like." BUT, if you want to be able to visit the sites for the full seven days and want flexibility, this Jamestown discounts deal may be the ticket for you. Loved scurrying through the ships and defending the fort from marauders at Jamestown Settlement? Want to go back a second day? No problem, if you have the Historic Triangle ticket. Bought a regular ticket (or even the Settlement/Yorktown Victory Center combo ticket) and want to go back a second day? You'll have to pay again during your trip. On the other hand, if you don't make it to one or more of the Historic Triangle sites, you'll definitely lose money. So make sure you really do plan to see them all before you buy one of these "mega" combo tickets. There are several free visitor guides for the Historic Triangle area. They are well worth picking up at area attractions, hotels and major restaurants. They offer dining, shopping, and attraction info, as well as area maps and...coupons for small discounts on local restaurants, select shops, and a few attractions. "The Official WHMA Visitor's Guide"
Which guide do we like best for visiting Colonial Williamsburg? It's close, but overall, we prefer "The Colonial Guide." It's smaller than the others, so it's easier to carry in a jacket, backpack or purse. The maps are clear and easy to navigate. Plus, the coupons are grouped in one section of the guide (easier to find). Second place goes to "The Official WHMA Visitor's Guide" for its clear maps and tear-out discount card (in case you don't have scissors handy to clip coupons!). And it has a few more attraction discounts than the others. Ultimately, we like to travel light. So what we do is this: pick up both. Tear out the discount card, the one-page coupon guide, and the map from the center of the "The Official WHMA Visitor's Guide". Then use "The Colonial Guide" to actually walk around with.